All the celebrities gathered at the Time 100 gala in New York City on Tuesday night to celebrate the magazine's 2015 list of the 100 Most Influential People In the World. The night included a 20-minute performance by Kanye West, who was one of Time's cover stars, a handful of celebrity photos and one amazing photobomb by Time honoree Amy Schumer. 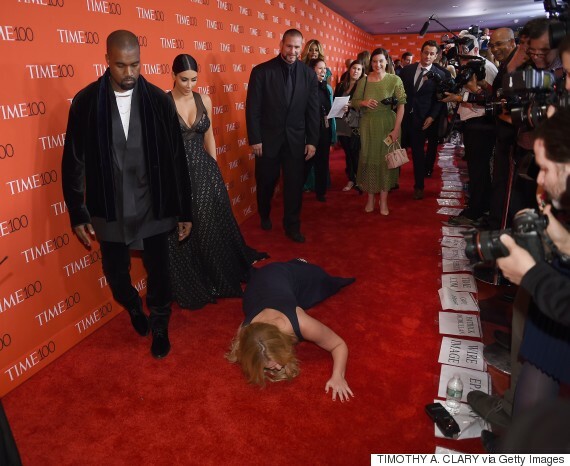 The stand-up comic pulled a Jennifer Lawrence on the Time 100 red carpet as she took a tumble in front of West and Kim Kardashian. But it was all planned, of course. The "Inside Amy Schumer" actress told Time about the fall afterward. “I saw them," Schumer said of Kimye, "and said to my publicist, ‘Can I pretend to fall?’ and she said, ‘I can’t stop you." And she certainly didn't. Amy Schumer for Most Amazing Woman of 2015, please?